Home » Environment and Occupational Health » Will the new PM and a new Gujarat CM save Gujarat’s Alang beach and the migrant workers? Will the new PM and a new Gujarat CM save Gujarat’s Alang beach and the migrant workers? When will Gujarat Maritime Board (GMB)’s new ship recycling policy, to be enforced with effect from October 2009 get finalized? When will the practice of taking undertaking from ship breakers on Rs 100 Stamp Paper end? Will the new govt. stop death of workers who dismantle foreign ships? May 22, 2014: – While the election campaign was underway, at least 6 workers were killed in March –April 2014 on the beach of Alang, Bhavnagar, Gujarat where dead and toxic foreign ships are being dismantled and poisoning the beach, the local ecosystem and the lives of migrant workers. The question which stares in the face is whether the new Prime Minister and the new Chief Minister of Gujarat intervene to save Alang’s ecosystem and the migrant workers. Meanwhile, an unhealthy practice of taking undertaking from ship breakers on Rs 100 Stamp Paper for giving plots on lease has given birth to unprecedented ad hocism for ship breaking on Alang beach awaiting finalization of a new ship recycling policy since 2009. In March 2014 while working in the ship breaking yards two workers were killed and four workers were crushed under steel plates that fell from beached end-of-life ships in April 2014. These deaths are not one time accidents. Such deaths have been going on since 1983 without any legal remedy. There were 10 deaths in 2013. In fact between 2001 and 2014, there were some 200 deaths on Alang beach. “I …the undersigned aged…adult being proprietor of the permission holder of Plot No…. (Name of the Firm) residing at ….Bhavnagar do hereby confirm on behalf of the permission holder for the following: ( 1) I understand that the new ship recycling policy, to be enforced with effect from 01/10/2009 is under finalization, till such time, Gujarat Maritime Board has extended the permission period granted under the Regulation-2006 for further 03 (Three) months or till notifying the new ship recycling policy, whichever is earlier. (2) In view of this, Gujarat Maritime Board has recovered plot development charge, plot rent and other charges to use the above plot for a period of three months i.e. from 01/04/2013 to 30/06/2013. The rate of respective charges is considered as stipulated in the above Regulation-2006, any differential amount payable for above charges or for Government/Gujarat Maritime Board in the new policy shall be paid by us in the manner as may be specified by the Gujarat Maritime Board (GMB). (3) During the permission period under the Regulation-2006 (01/10/2004 to 30/09/2010) we had to cut LDT of 100, 000 Tons to be eligible to get renewal under the new policy. We did not cut the LDT as per this stipulation and therefore are not eligible to get renewal under the new policy. We shall abide by the decision of the Gujarat Maritime Board in this regard without any dispute and/or compensation. This undertaking demonstrates the ad hoc nature of the regulation and supervision of the ship breaking industry. Not surprisingly, Gujarat's Alang beach is a graveyard of ships, migrant workers and ecosystem. As per Hon'ble Supreme Court judgment dated September 6, 2007 in Writ Petition (Civil) no. 657 of 1995, District Collector, Bhavnagar has to ensure that dismantling takes place as per a dismantling in keeping with its directions. Sources have revealed that in disregard to Court's order so far the District Collector has chosen not to be associated with the dismantling process. Such non-compliance is unpardonable but appears routine. The monitoring agencies like Gujarat Maritime Board, Gujarat Pollution Control Board, Department of Industry and Department of Labour ought to be made accountable with exemplary compensation to set matters right. In the context of these deaths if Government of Gujarat were sensitive it would have ensured that no deaths happen in future by re-opening the old cases of occupational deaths on the Alang beach to set matters right. Those plots which are more accident prone than mines must be closed with immediate effect. The migrant workers deserve both medical and legal remedy besides just compensation. The transfer of end-life-ships must be seen as part of illegal shipment of hazardous waste "from industrialised countries is being shipped to less developed countries under the listed intention of recycling and reclamation," which is a serious problem. This has been noted by INTERPOL as well. According to Green Customs Initiative, national and international crime syndicates earn 20-30 billion US dollars annually from hazardous wastes dumping, smuggling proscribed hazardous materials. Clearly, environmental crime and escaping of decontamination cost by global shipping companies in collaboration with international recycling industry is a significant and increasingly lucrative business but governments since 1983 have turned a blind eye to it. 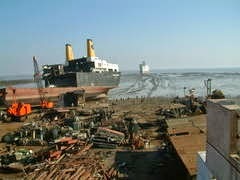 The new government at the centre should factor in Gujarat government’s right step of closing the Sachana plots in November 2011 citing massive pollution as a reason, Sachana shipbreaking plots in Jamnagar district, Gujarat where some private agencies have been carrying out ship-breaking work. The closure order read: "The ship-breaking is termed illegal because this breaking activity is going on in the water of Marine National Park..." stated an order dated 22-11-2011 from the Office of Chief Forest Conservator. The order said: "Because of ship-breaking, harmful objects like arsenic, mercury, asbestos, oil, etc could harm marine life in the long time. This leads to complex problems for protecting and conserving the Marine National Park and Marine sanctuary." These observations are quite relevant for the ship-breaking operations on Alang beach, Bhavnagar as well. This similarity cannot be ignored as it would tantamount to manifest inconsistency. As if old problems of handling the dead and hazardous ships of foreign wasn’t enough MSTC Limited (formerly known as Metal Scrap Trade Corporation), a Public Sector Undertaking under the administrative control of the Ministry of Steel, Government of India has proposed to set up an integrated ship recycling yard under the Public Private Partnership route at Alang beach in Gujarat. The Ministry’s panel headed by its Additional Secretary and Financial Adviser, Vinod Kumar Thakral has suggested MSTC contact GMB or the Gujarat government with the proposal. Alang beach has been divided into 167 plots for ship breaking on 10 km long coast. ToxicsWatch Alliance (TWA) which has been an applicant in the Supreme Court in the matter of hazardous wastes/ship breaking has written to the Inter Ministerial Committee on Ship breaking about these concerns but they refrained from acting due to election campaign which was underway. It has filed a case with the National Human Rights Commission with regard to ongoing deaths on Alang beach seeking its urgent intervention to protect migrant workers and local communities from the hazardous industrial activities on Alang beach that has remained unaddressed so far. The regime of blind profit at any cost has been ruling the roost on this ecologically fragile Alang beach. It appears that the world's most controversial beach has been colonized by the global shipping companies for good. At present businessmen of dubious shades they are aiding and abetting colonialism by dumping hazardous waste at the behest of shipping companies of foreign companies. It is hoped that based on lessons from Sachana, the new government at the centre and in Gujarat, would safeguard the coastal environment of Mundra by refusing permission for the proposed ship-breaking/recycling facility and send a clear signal to the foreign ship owning countries that they should keep their own waste and recycle it.